“Drink chhaang, nectar of the Gods. Then eat shutki”. I didn’t know which one made me more reluctant: the pungent smell of the fermented millet drink travelling to my nostrils, or the sundried little fishes, their round eyes fixed on me morbidly. As I directed their heads towards my mouth, my bitter face anticipated the bad circus about to perform on my taste buds: my look was unmistakable. As I victoriously finished my glass, chasing each sip with a fish, each bite with the ‘wine’, Manik refilled my cup instantly. “Oh no thanks, Manik,” I implored, battling with a piece of fish scale stuck between my teeth. “Mountain tradition! Glass always full. Drink!” he insisted, as his chubby cheeks blushed from the consumption of the home brew while passing around the shutki. Manik is a 5-foot tall Nepali. His petite stature didn’t seem to be of the average Himalayan guide. However his leathered skin, yellowed eyes and chapped lips confirmed a heavy exposure of sun and cold, prop to a mountain life. 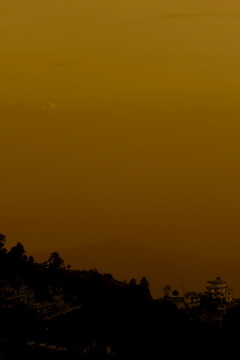 Two days earlier, we had booked a three-day trek around Kathmandu, the capital and gateway to tourism in Nepal. Located at the foothills of the Himalayas, Nepal has been an admired destination for trekkers and climbers since the 1950′s, and has been on my list for a long very time. 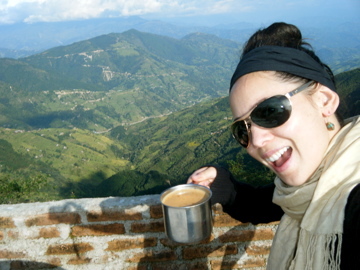 This was the perfect way to start our 2-month backpacking adventure through South Asia. It was an early morning in November when Manik picked us up from my hostel. The taxi dropped us at the entrance of the Shivapuri National Park, on the northern fringe of the Kathmandu Valley in Sundarijal. Chicken roamed near a set of steep stone steps built into the mountain. Goats followed our ascent, feeding occasionally on woody plants along the trail. We trekked through sprawling forests of pines, oaks, wild cherry and rhododendrons. The forest gave way to rural villages where we caught a glimpse of villagers going about their day. The scenery enhanced with every step we took. We traversed alpine meadows, hiked through yak pastures and crossed glacial moraines. Soon we reached the clouds, piercing through thick fog and crisp air. When the trail narrowed in the jungle, we observed the prayer flags hanging from the trees, floating through the mountain mist. As we gained elevation and started to hike the mountainside footpath, we feasted on the views plunging into a dramatic landscape of maize fields and rice terraces. 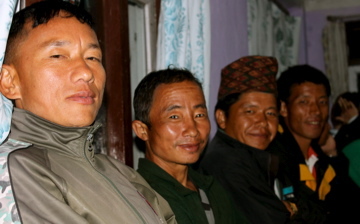 When we arrived in Chisapani, we entered a candlelit teahouse where a group of guides and porters chatted around a table. Manik invited us on the rooftop terrace, where he happily served us hot tea from a silver tray. The night was cold as winds swirled through the cracks of the stone walls. The teahouse was without electricity, hence dark, cold and drowned in quietness. I curled into a ball, tucked in with wool blankets. Memories filled the emptiness as I drifted into sleep. It was 5am when we awoke to a profound silence. It felt like we were in a different world, dazed in a haze of peacefulness. A heavy fog slowly entered the windows like a mountain ghost. We started our daily trek well rested and fed. However, the slanted trail reminded me of my unshapeness. My legs endeavored with difficulty to succeed. “I carry bag,” suggested Manik, his round-shaped head nodding with a persuasive smile. “Oh, no, but thanks,” I refused with a frazzled smile. He insisted: “Me porter before. Carry big bags for weeks, bigger than you, bigger than me”. He expansed his lean body, exaggerating the size of a tourist’s bag. His goofiness amused me. Yet, I resisted his offer, and sweated my decision every step I made. “How was it to be a porter?” I asked while scrambling across a river. Manik told me about the time he lived in the city, working as a rickshaw driver. Unluckily, he almost lost a leg in a traffic accident. He returned to the mountains to recover, and then became a porter. “Me no English,” he pursued, wind ruffling his raven-black hair. “Carry tourist bags for days, weeks, months in mountains. Hard work. People mean sometimes. No shoes. Me not look strong, but very strong.” He flexed his biceps with a giggle, his feet sliding down into his oversized and overused sneakers. “Porter for 15 years,” he continued. “Work hard. Learn English talking to tourists like you. Guide now. Hope to trek Everest. Good money Everest,” he explained as he pointed to the horizon. The trek became effortless as I sank into Manik’s life stories. How could he seem so content, healthy in and out, living a life that is so far from what I can possibly relate to? I empathized. I was inspired by his optimism and heartened by his genuine care. 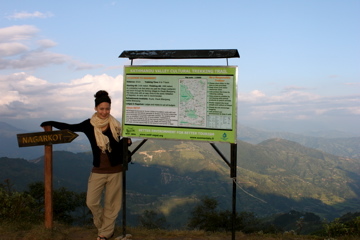 Eight hours and a dozen swollen bug bites later, we reached the second summit of our trek, Nagarkot. My legs were inflamed, my face was red as a beet and the sweat dripped off my forehead endlessly. “How I’d go for a glass of wine right now!” I exclaimed between two breaths. I looked at Manik trotting down the dirt hill, fading with the dusk. As the moon rose up and settled in the sky, we gathered around a low table and sat on wooden drums outside a vendor’s hut. 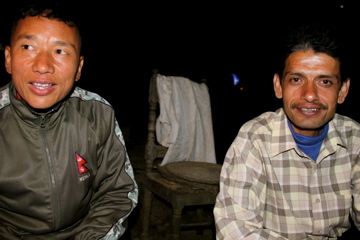 With the company of a fellow guide, Manik cracked the re-used water bottle and poured the chhaang in four glasses. Then came the shutki. The family that lived in the hut watched us with curiosity from the inside. He asked about our journey. I asked about his dreams. We conversed about life while the moon crossed the starry sky. We watched the sun rise over the Himalayas, snowcapped Mount Everest slowly piercing through the blushed clouds. As I contemplated the hues of the sky, I thought about Manik, and how he led me to a new way of seeing things. Just like my taste buds, he allowed me to be aware of the things I failed to appreciate. And while tourists snapped photographs of the morning spectacle, I stared in the distance, pondering the why and the how, and gazed upon a life of beauty and misery. We returned to the buzzing backpacking town of Thamel, where tourists and locals congested the tight alleys. I soon missed the stillness of the mountains, where my thoughts reflected far and beyond the open space. I gave Manik my brand new trekking shoes. They perfectly fit his feet. He wrapped a white silk scarf around my neck, a khata, symbolizing compassion and purity. We parted in different directions. And as I stood amongst the moving crowd, I closed my eyes. Suddenly, I was back in the mountains, walking on the rugged trails through the Himalayan mist, along with Manik. “You want chhaang?” he’d ask.